Athletes are calling for support this weekend as they go all out to beat their 5km records. 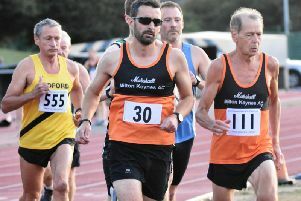 The MMKAC-run event will take place at Stantonbury on Saturday, and will feature 11 races, starting at 3.45pm, as athletes aim to beat their best times. In a bid to improve the spectator experience, fans will be allowed up close and personal with the athletes, cheering them on from lane 4 on the track. The last three races, promoted by the British Milers’ Club, starting at 7:45pm will feature many of the strongest 5000m runners in the country. The penultimate race, for elite women, will feature Great Britain’s Jessica Judd. Each race will be paced to 3,000m to ensure that there will be great opportunities for runners to achieve personal bests. Most of the races will involve 15-25 runners. Two race clocks will be used to give runners up-to-date information. Commentators will keep spectators well informed and there will be music to add atmosphere.